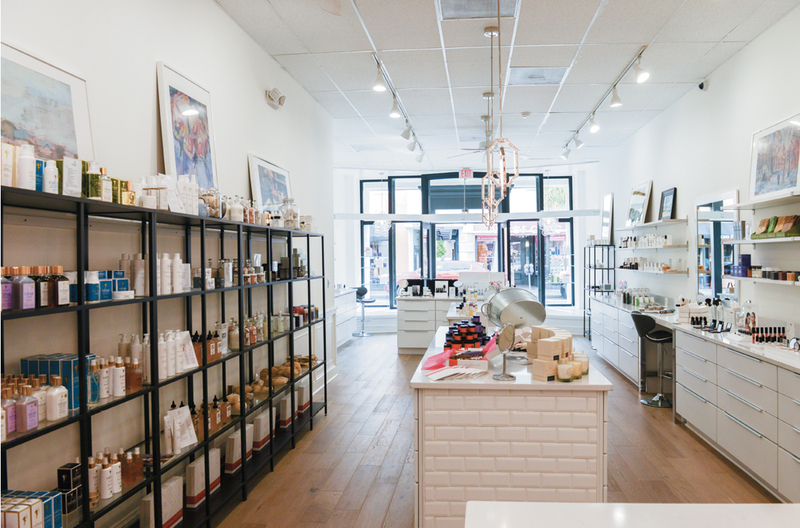 The past year has seen a surge of clean beauty–both products and boutiques–rolling into Charleston. The latest to open is AILLEA, a small chain that started in Denver and stocks only makeup and hair products with non-toxic ingredients–that means no parabens, sulfates, petrochemicals, or endocrine disruptors. Packaging tends to be eco-friendly, too, and animal testing is off the table. Jessica Morse, a mother of two (and former model) who lives downtown and pens the nationally popular blog Bare Beauty, says AILLEA’s arrival is a big deal. We visit with her to learn more about “clean beauty” and to find out how it can factor into a bride’s world. Charleston Weddings: Tell us why clean beauty makes sense. Jessica Morse: You should not have to sacrifice your health for shiny hair, clear skin, or pretty makeup. All of this can be achieved without toxins, so why use them? CW: How did you get into championing it? JM: About seven years ago, I was having some unexplained health issues and I was having trouble becoming pregnant. My naturopath suggested eliminating as many endocrine-disrupting, carcinogenic toxins from my daily life as possible and mentioned that personal care and beauty products were generally big culprits. I did some research and decided that I would do whatever I could on my own that would improve my health and my chances of becoming pregnant naturally. I started switching out products for healthier options, and I began to document my journey on my blog for friends and family. I never dreamed it would turn into a career! CW: When did you first notice the trend taking root in Charleston? JM: About two years after I began blogging Ooh! Beautiful in the Mount Pleasant started to carry clean beauty options and Wildcraft in West Ashley opened two years after that. CW: Would a bride be a good candidate for clean beauty products? JM: I actually recommend using a mix of clean and conventional beauty products for big occasions. Normally, I am not a fan of conventional, waterproof mascara—it’s irritating, drying, and super toxic—but your wedding day is not the time to have black tears running down your face. However, I’d stick to a nontoxic skin care routine leading up to and on the Big Day. CW: How would you start someone on the clean bandwagon? JM: The products that are the most important to switch out are the ones you use the most often and those that cover the most surface area of your body—namely body wash, body lotion, deodorant, shampoo, hand sanitizer, sunscreen, and lip products. After that, I suggest trying to replace products as you run out of your old ones. CW: Can you shop makeup counters and/or drugstore makeup shelves for clean products? JM: Target is really catching on. They carry great, nontoxic brands: Acure, Dr. Bronner’s, Gabriel Cosmetics, W3LL PEOPLE, S.W. Basics, Weleda, and ZuZu Luxe. STAY: The Beach Club at The Charleston Harbor Resort & Marina is Charleston’s first (and only) LEED certified hotel. And The Dewberry is nearing their LEED certification. DRINK & DINE: I love to go to Huriyali for a morning smoothie and drink it in their garden. The Harbinger Café & Bakery has the best lunch and the perfect iced coffee for a midday pick-me-up and for a local, clean dinner, and drinks, one of my favorites is Basic Kitchen. EXERCISE: I recommend enjoying the beauty of this city on foot. Walk around and get lost, and enjoy all it has to offer.